From the fifteenth century there is evidence of the celebration of bullfighting in Murcia, although there are graphic documents from the thirteenth century, in the time of Alfonso X and his 'Cantigas'. The capital, Lorca and Cartagena were the first in feast of bulls. Many are the towns of the province where fairs are held and bullrings were built. 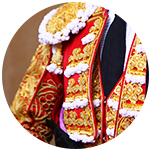 The towns of Blanca and Moratalla also hold 'encierros'; in addition, the province has an important number of bullfighting clubs. 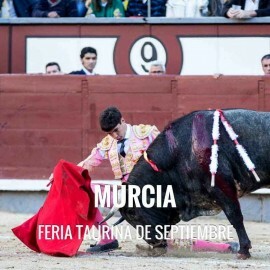 But in the Region of Murcia stands out the Rice Fair of Calasparra, one of the most important bullfighting fairs in the country, both for the seriousness of the steers that fight there and for the category of the young bullfighters that come. Murcia capital celebrates the September Fair, of medieval origin, in honor of its patroness Virgen de la Fuensanta, and has been declared of National Tourist Interest since 2012. 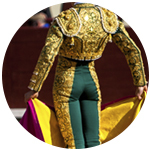 The Bullfighting Fair is an essential part and is celebrated in 'La Condomina' Bullring. 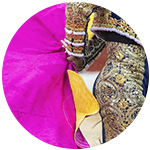 The Fair is celebrated during the first fortnight of the month of September and usually consists of five celebrations, including a steers-bullfight and bullfight with horses. Address of Murcia Bullring: La Condomina, Ronda de Garay 48, 30003 - Murcia. 2018 was a triumphant fair, with Main Door in the five festivities. Rafaelillo and Sebastián Castella cut two ears each the first afternoon with Parladé bulls, which was a hand to hand after the absence of Cayetano. Paco Ureña cut four ears to the bulls from Daniel Ruiz, who left on shoulders with El Juli who cut two. Full session on the third day with Victoriano del Río bulls; two ears for Pepín Liria, four for El Fandi and three for Roca Rey. With the steers from López Gibaja, Marcos and Ramón Serrano cut three and two ears respectively. And closed the bullfight with horses with cattle from Los Espartales and Luis Terrón. Four ears cut Andy Cartagena, two Sergio Galán and four others Diego Ventura; they left on shoulders next to the mayoral of Los Espartales. We regret to inform you that, currently, Servitoro does not have tickets for this show, but we recommend other bullfighting experiences a few kilometers from Murcia. Servitoro, bullfighting news of Murcia Bullring.